As you know, we've had some reliability and quality issues with our 2017 Chrysler Pacifica. 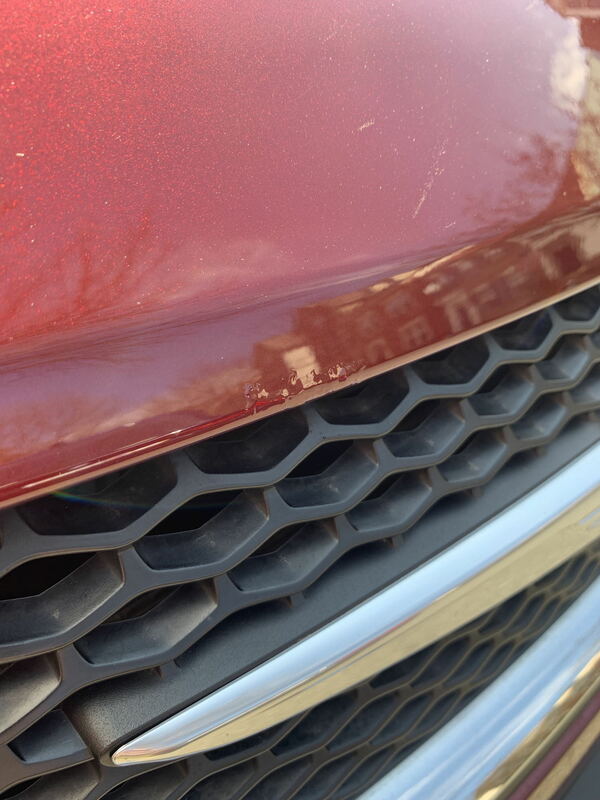 Latest one is this paint bubble on the leading edge of the hood that popped up within 3 weeks (wasn't there last time I got it washed). Apparently another common issue on the Pacifica. If it doesn't get worse I'll probably just leave it vs messing with them repainting the hood. Will be my last Chrysler! Were there any stone chips on the hood before the bubbles popped up?...or don't you know? Rust getting started on bare metal, under the chips, can eventually make rust-bubbles. Stone chips are common if you spend a lot of time following high-speed traffic on the Beltway or local Interstates, or follow dump trucks in and near construction areas. If it is indeed factory paint defect...a shame, since FCA has some of the best and most interesting paint-colors on the market, especially on the Charger/Challenger/Wrangler lines. Last edited by mmarshall; 04-07-19 at 02:14 PM. You should of got yourself a Sienna, and bought it for the long haul. Siennas are not necessarily trouble-free. My ex-Flight Instructor has had two recent ones, one for personal use, and another for his company. Both had problems that, he felt, were not adequately addressed by the dealer and factory under warranty. How is it possible to get the factory to address your problem? I don’t get it. His problems (as I recall) were mostly with the sunroofs, and, despite several warranty claims, he says they either didn't repair it correctly, had repeat-problems in a short time, or argued wth him that the claims weren't properly documented within the allotted time/mileage period. Back to Steve's problem, though....since the van is in the 3-year time period (and probably the 36,000 miles) for the bumper-to-bumper coverage, Chrysler should probably give him a free hood repaint, unless that they can claim that rust got started because paint-chips were not dealt with earlier. Last edited by mmarshall; 04-07-19 at 02:49 PM. Pacifica's (and indeed every FCA product after 2010) has an aluminum hood. Aluminum doesn't rust. But it will corrode. That is what is happening below the paint surface there. As such, I would raise hell until they fix it. Sure as **** you go to turn it in like that off lease and watch 'em charge you for it. My 2011 SE with 140k miles had 1 bad oxygen sensor (around 60k that I replaced myself) and the intermediate drive shaft clunk replaced (under warranty), not to mention the Takata airbag recall. With a lot of oxygen sensors, replacing it is not a big deal if the threads aren't seriously burned in, as the sensors are shaped and threaded more or less like like a spark plug, and screw in and out of the exhaust manifold. But, the manifold runs so hot (800-900 degrees F) that, over time, the threads can get burned in so bad that it is exceedingly difficult or impossible to unscrew it, and it much be extracted by other means. I've heard of them being drilled out and the manifold re-threaded, but don't know the details of how that's done...Josh would probably know about that more than me. No stone chips. Its actually a very common issue with the Pacifica, if you search on the Pacifica forum there are multiple threads. It'll be covered under warranty sure, but the hassle of being without it while its done, fighting over paint match, etc isn't worth it unless it gets worse. Like was said, the hood is also aluminum - so it isn't rust. Even if it weren't though, no way a stone chip should rust like that in a non rust-belt climate after 17k miles. Sienna is too old a product, if I had it to do over again I would have gotten an Odyssey. In any event, no van would be a long haul vehicle for us. Do you realize that your luxury car you are driving around in is on platform that is older than the Sienna’a platform? We've had this conversation before. Absolutely, but the two vehicles serve two different purposes in our household. The LS' age doesn't bother me, because it doesn't have any features or design interfaces I dislike, it doesn't lack any technology or features that I want, etc. The car also has a lot of attributes that I really like, it was a great deal too which helps. NA V8 which I like, so on and so forth. I sought the car out specifically. The Pacifica however is a family appliance. The Sienna has an awkward driving position and dash layout, lacks important for us tech such as individual screen/entertainment centers for our kids, easily storing second row seats, its smaller inside, lacks a ton of infotainment features that are important to us in that van, and doesn't have anything about it that appeals to us other than Toyota reliability. Interior is nowhere near as nice as the Pacifica. Its also MORE expensive than newer better vans. The Pacifica is just a better designed, more user friendly family appliance. Where it lacks is in reliability and product quality. The Odyssey isn't quite as well thought out as the Pacifica but its way more modern than the Sienna and likely a better quality product than the Pacifica. Despite it being old they kept up with updates to the LS and it doesn't feel dated to me. The Sienna however, does. We didnt even consider the Sienna when we bought the Pacifica after having looked at it in 2015 when we got the Sedona. Last edited by SW17LS; 04-07-19 at 09:20 PM. How old/new a car is has more to do than just with the underlying platform. The drivetrain can remain the same, but the interior features/tech/safety equipment can vary greatly. Apple Car Play is one very simple example of something like this. Your dad's updated power window switches are another.